Sometimes what our City Hall doesn’t say can be almost as illuminating as their press releases. 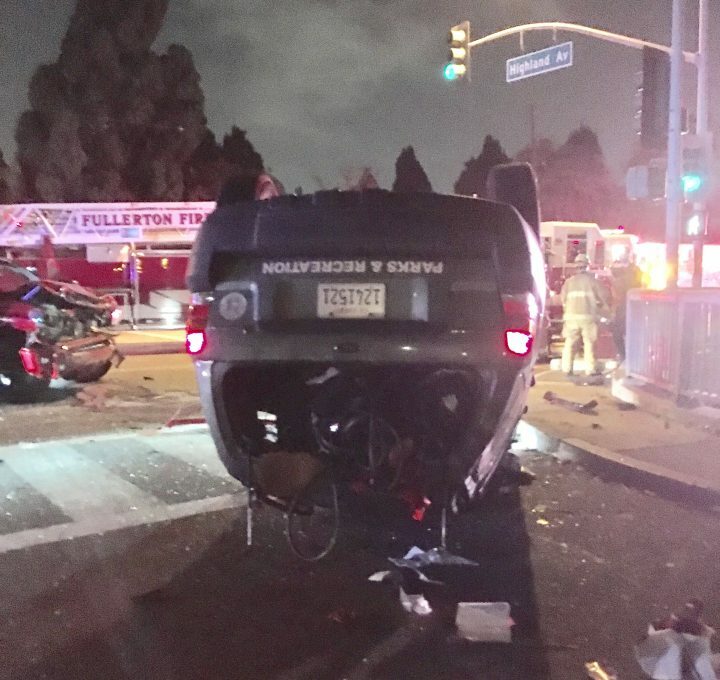 On Wednesday, November 16 at about 9:00 PM, a Fullerton Parks and Recreation vehicle collided with another car at the intersection of Highland and Chapman. Ouch. Sure looks like somebody ran a red light, then blammo! What’s odd about this unfortunate accident is that the City never said a word to the public about the horrible-looking incident. Who was involved? Was anyone badly hurt? Who caused the accident? Why was a Parks and Rec employee driving around late at night? So many questions, and no answers. What’s the big secret? Maybe there’s a reason for the radio silence. It makes one wonder if this accident might not be the fault of a government employee, perhaps even driving a city-owned vehicle after hours. If so, look for big damages coming our way. I’ve seen much worse injuries that were survivable. The upside down city park & rec vehicle appears to have been heading north on Highland? You know who lives north of Chapman at Highland, or who use to live north of Chapman at Highland? Yep, poor old Sappy McTree. Which park up Highland is open at 9:00 pm? Did this one cause another secret memo to the city council members that they are hiding from us? I will wait until city hall makes a press release. Until then, this incident did not occur. Fake news. LOL. Yes. Let the investigation run its course. No need to speculate. No rush to judgement. All will be well. The police constantly report on FB and elsewhere about accidents. The system is set up in their favor, not yours. The cops can release bits of information at their discretion, but you have to ASK them for information, and they are free to deny it. This power is useful. Creepy cops like former PIO Andrew Goodrich use it to turn psuedo-reporters into slavish boot-lickers. Think Lou Ponsi, David Whiting, Sharon Kennedy. Dat inclood hittn’ da tree? Someone needs to do some serious investigation on this! FFFF, sounds like a job for you! Good news, there are more of us than ever before. I have seen these vehicles around town after hours for some time now. So much abuse of the taxpayers by the city employees. Joe Felz was running a real loose ship. My guess is that somebody was driving a city-owned car after hours when the crash occurred. So no news. If this is true, let’s hope the city driver wasn’t at fault. This was just a few days after Felz put himself on “voluntary” leave. My guess is the person driving the upside down Fullerton parks and recreation car is an employee of Fullerton pars and recreation. This person probably worked years for this goofball agency, and still does. Simply list names of Fullerton parks and recreation employees who have risen through the ranks to gain access to tax payer subsidized wheels who,likes them to,interface with the sky. 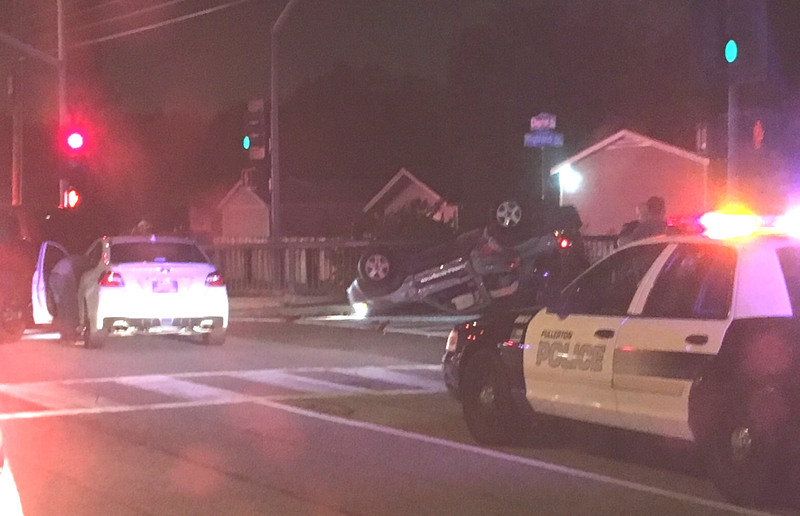 I heard the accident from my house and went to see if everyone was okay. When I got there I saw the passenger of the parks and wrecks car. The passenger was in shock so I helped until the Fire Truck and ambulance came. There were 3 young men in the parks car and they looked to be maybe 21 and were not in city attire. They were very concerned about the items in the parks car. You can see in the photo that there is some kind of welding torch. They tried to take it from the scene of the accident but were stopped by CSI. Hugo Curiel, Director of Parks and Recreation arrived and spoke to the police. He then went over and spoke to the young man that had tried to retrieve items from the accident site. This time time they were successful. Looks like another cover up between police and city managers. Ohhhhhh…I saw the remains of that car sitting at the Basque yard a month ago and wondered what happened. Now I see. Fullerton parks and recreation main page website is up, but clicking on its commission members, community centers and the rest , all I saw was the sorry page. Still nothing from city hall? Are we pretending that this didn’t happen?